I wanted to show you all what I wore to see Kevin Hart at the Improv. I found this blazer thrifting and the shirt at Zara. I’m wearing one of my favorite pair of jeans from NY & Co. I love everything about them. The fit. The length. The wash. They can be dressed up or down. I usually dress them up with heels as you see pictured here. Before I go I do want to ask a question. Did you read Reiko’s post here? I also read a post from one of my favorite mommy bloggers Alinka here and it got me to thinking. I started wondering what are your thoughts about these two issues? Do leave a comment!! Am I really driven by all the fashion blogs and magazines I read? Truth? Yes I am. I want to always be on point and look fabulous. I want readers to stop by my blog and comment (more on what I’ve written about than my outfit). I want someone to recognize that I’m a decent writer and invite me to work for them doing something great that pays well. Reality is I’m an amateur blogger. A decent writer and my camera is currently jacked up. I’m not doing this to make money. You must decide what your purpose and motivation is behind blogging or any other activity you commit to. I shouldn’t compare my blog with anyone else or myself to anyone else in any category. We are individuals and that’s makes the WWW so inviting. No two people have to create, maintain and write for a cookie cutter blog. I subscribe to the blogs that I read for the fashion but there are other reasons. I even follow blogs of individuals who wear Loubertin’s every other day and other blogs I stalk but never post a comment. I’m just saying that I don’t go to bed mad that I ain’t walking in their stilletoes! Am I a confessed shopalcholic? Yeppers but I’ve had to cut back because my check has been cut and there are way more important things to do. One valuable lesson blogging has taught me (because I don’t want this to be a negative post) is recycle, recycle, recycle and thrift. Do I really need another pair of Jessica Simpson shoes tomorrow? I’ve never been a creative individual but blogging has helped me tremendously in this area. I just want to encourage those of you who think you aren’t up to par to do YOU and YOU only. Write and someone will read. They may not comment but trust that if you are doing what you love with the gift and talent GOD has given you, He is allowing you to reach the 1 or 2 or 300 individuals you are assigned to “minister” to. Let’s not allow the world of blogging to stir up feelings of jealously, inadequacy and longing for things of this world. If you read your Bible you’ll know that our worldly goods will someday hold no value. 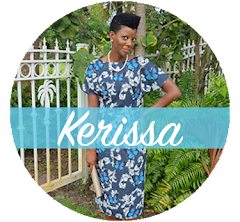 I’m here blogging as an outlet and I’m so grateful for the connections, friendships, sisterships and networks I’ve made. Great Message! Love this post. You look lovely darling. Give me that TOP!!!!! couldn't have said it better myself! and why shop retail when you can find a FABULOUS red blazer like that in the thrift store! It's THEBOMB.COM. Great Post! I so agree! Cute look....some of my favorite jeans are from NY&C as well. Great Post!!! Well said! Very Cute look! Loving that blazer.. The thing about fashion bloggers, in my humble opinion, is that we show so much love for each other. I do not do this to make a living either. Nor do I care what other bloggers have or receive. I have been so blessed to be in a very lucrative career. I do this because I simply LOVE fashion and style. 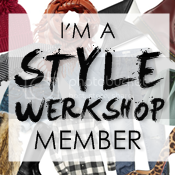 You fab bloggers inspire me and I definitely love stalking your stylish outfits, lol. I've been blogging for 3 years but I just recently started to discover the limitless blogosphere of fab divas who are doing the darn thing. Keep up the awesome work! Oh yeah, check out my blog tomorrow for a fab giveaway. Gurrrll...I "HEART" your style! You're sooo FAB!! I'm absolutely lovin' that blazer! HOT!! I love the animal print with the red blazer. Very chic look! I looooe that blazer with the leopard print top. You always look so chic. OMG!!! Thank you so much for this message! I'm new to blogging and I have found so many other fashionistas out there who have inspired me... and now you have been added to that list of wonderful women. Your style is awesome and once I sit down for the evening, I will read more on your site... but from what I've seen so far, I LOVE IT!! 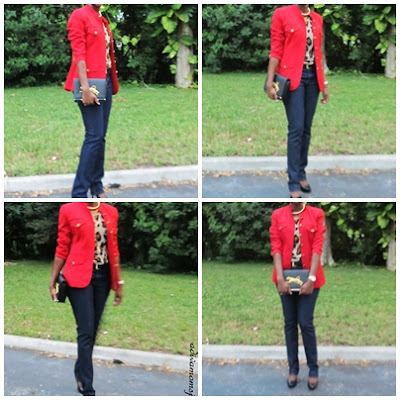 First, you look amazing.That blazer is so sharp and red looks great on you! I read both posts you referenced and the answer is YES. I am influenced in a good way by all of the amazing bloggers and I include yourself in that category. There have also been times I have read blogs I admire and felt inadequate, but we all bring something unique to the table. Need to email you but can't find your email address. HELP!